June 10, 2013, Anchorage, Alaska: Today, the Secretariats of the Conservation of Arctic Flora and Fauna (CAFF) and the Partnership for the East Asian-Australasian Flyway (EAAFP) signed a Resolution of Cooperation to better coordinate efforts to promote and protect birds along a migratory flywaythat is home to over 50 million waterbirds. The East Asia-Australasian Flyway is a major waterbird migratory route. It extends from the Arctic Circle in Russia and Alaska, southwards through East and South-east Asia, to Australia and New Zealand in the south, encompassing 22 countries. The flyway contains the migratory passage of 33 globally threatened species as designated by IUCN. Migratory waterbirds – shorebirds, ducks, swans, geese and cranes – share this flyway with 45 percent of the world’s human population, and some species are under threat as a result of human activities including habitat alteration and destruction. 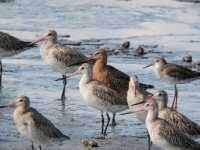 According to the last Arctic Report Card, Arctic wader populations plummeted for eleven of the 32 species assessed including Eastern Curlew, Great Knot, Red Knot and Bar-tailed Godwit.Scientists do not know enough about current or past populations to determine a trend for the remaining 21 Arctic species. The remaining populations of some of the most-at-risk Arctic bird species live in this flyway, including for example the Spoon-billed Sandpiper, a Critically Endangered shorebird facing imminent extinction. This bird breeds in Chukotka, Russia and passes through coastal wetlands in China while migrating to wintering grounds in South-east Asia. According to the recently published Arctic Biodiversity Assessment, during the last 30 years, the number of Spoon-billed Sandpipers has decreased dramatically from about 6,000 breeding pairs to just a few hundred pairs. Besides loss of habitat in staging and wintering areas, the most critical cause of the decline appears to be indiscriminate hunting in parts of Southeast Asia, where the birds are caught in mist nets and sold to local markets as food. In the region including Alaska, at least 29 species of ducks, geese, gulls, loons, eiders, and shorebirds regularly migrate across the Bering Strait. Three species are of particular note, since a large portion, or the entire population migrates through the EAAF. These include the Bar-tailed Godwit, Dunlin and Sharp-tailed Sandpiper.The ‘western’ Bar-tailed Godwit nests only in Alaska and spends the winter in New Zealand and Eastern Australia. On their northward migration the entire population of these Godwits, which numbers between 100,000 and 150,000 birds, stage for several weeks exclusively on intertidal habitats of the Yellow Sea. These habitats are facing unprecedented and continuous rates of habitat alteration. On its southward migration, Godwits fly from Alaska nonstop directly across the Pacific Ocean to their over wintering grounds. Migratory birds link all corners of the world. To conserve migratory species effectively, international cooperation between Arctic and non-Arctic States is required. To this end the CAFF and EAAFP objectives and activities complement one another. The Resolution of Cooperation formalizes cooperation and contributes to building and sharing knowledge, creating awareness and enhancing capacity for conservation of migratory bird species along the East Asian-Australasian Flyway. The document was signed at the 7th Meeting of the Partners to the EAAFP in Anchorage, Alaska, hosted by the U.S. Fish and Wildlife Service, the U.S. representative to the CAFF. The EAAFP intends to use relevant and available opportunities to promote the importance of Arctic migratory bird species, including status, trends and threats, and the dissemination of CAFF program material where appropriate. CAFF intends to seek opportunities to raise awareness, and develop supportive actions for the conservation of migratory bird species and focus attention on the challenges facing species along the East Asian-Australasian Flyway. CAFF’s Arctic Biodiversity Assessment and Circumpolar Biodiversity Monitoring Program will facilitate the exchange of information on migratory bird species along this important flyway. About the East Asian-Australasian Flyway Partnership The Partnership, adopted in the list of the World Summit on Sustainable Development (WSSD) as a Type II initiative –is an informal and voluntary initiative, which aims to protect migratory waterbirds, their habitats and the livelihoods of people dependent upon them within the Flyway. There are currently 30 partners including 15 national governments, four intergovernmental agencies, 10 international non-government organizations and one international business organization. For more information see www.eaaflyway.net.